Yes, pumpkin spice is all the rage, but in Jackson County the restaurants, breweries, cocktail lounges and chocolatiers go far beyond this one popular flavor. Instead, these food and drink purveyors create dishes and beverages using in-season fruits, nuts and vegetables that epitomize the rich warmth of the season. We’ve pulled a few of our local favorites that can be found on seasonal menus throughout Jackson County. Below, find a list of foods and flavors that will feed your cravings for fall. White Moon Coffee Shop: Located in Sylva, this specialty coffee shop offers its own spin on the popular pumpkin spice latte. For a different taste of the season, try the apple cinnamon latte. The Coffee Shop: This long-time Sylva staple is famous for their pies, and this fall they will be adding pumpkin pie to their list of tasty treats. Slab Town Pizza: This Cashiers pizzeria cooks up hand-tossed pies topped with the freshest ingredients, along with salads, calzones, sandwiches and other offerings. As the season changes, the menu will feature a chopped salad full of cabbage, kale, brussels sprouts, roasted chickpeas, butternut squash and cranberries accompanied by an apple cider vinaigrette. To warm up, diners can also order the restaurant’s New England Clam Chowder. Dillsboro Chocolate Factory: Satisfy your sweet tooth with a variety of new fudge flavors. With caramel apple pie, carrot cake, red velvet, pumpkin pie and pumpkin praline on the menu, you might find yourself trying them all. Not to be outdone by the area’s restaurants, Jackson County’s cocktail lounges and breweries have created their own unique menu items to celebrate the arrival of the new season as well. The Paper Mill Lounge and Theatre: This New Orleans-style cocktail lounge, located in Sylva, will offer fall beverages such as a brown sugar old fashioned and an apple cider martini to satisfy your craft cocktail cravings. The Cut Cocktail Lounge: This eccentric local gem will be rolling out a whole new seasonal hand-crafted cocktail menu in early October. Stop in to Sylva to try their Immune System Booster, featuring elderberries stewed with local honey, turmeric, fresh shaved ginger and cinnamon to make a delicious cocktail that’ll warm you from the inside out. Whiteside Brewing Co.: Located in Cashiers, Whiteside Brewing proudly states it serves up “mountain life in a glass.” During the fall, that includes a taste of the season with its Oktoberfest Beer, as well as a pumpkin spice beer. Additionally, the Smalltown Stout, a regular menu item, contains rich, roasted flavors that are perfect for fall. Innovation Brewing and Innovation Station: With locations in Sylva and Dillsboro, craft beer lovers can easily find an autumnal ale at these sister breweries. 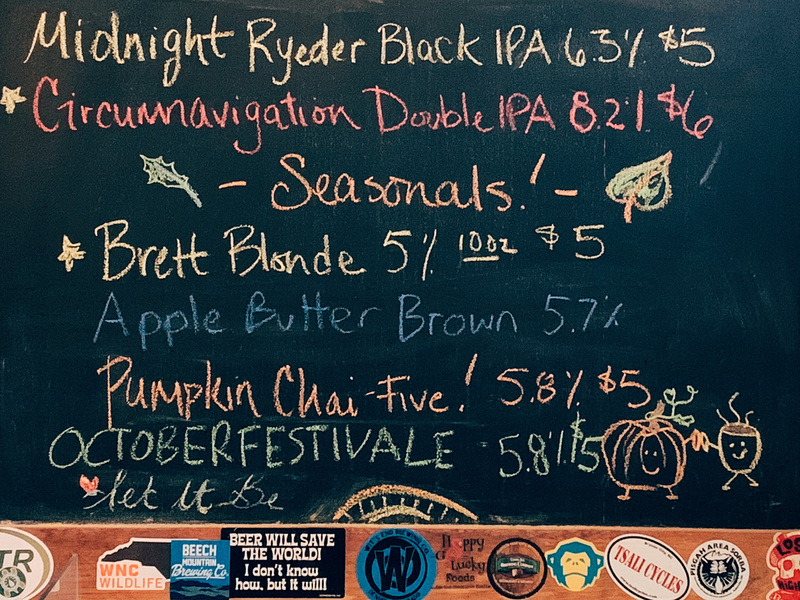 These include Apple Butter Brown Ale, Pumpkin Chai, which contains subtle pumpkin flavors and is malty with sweet hints, and Oktoberfest Ale, a traditional malty with caramel accents. Balsam Falls Brewing Co.: Located off of Sylva’s Main Street, this local brewery offers an Oktoberfest beer each fall that highlights caramel and spice flavors. Several of our shops buy their local ingredients weekly, so depending on what is available, seasonal flavors may depend on what is available. For a limited time only, Jackson County’s restaurants and breweries will overflow with these seasonal flavors, so get your fall fill and plan your next foodie getaway today. The county is home to a number of accommodations ranging from affordable hotels to intimate bed and breakfasts that provide a perfect place to cuddle up and call home during your next visit to Western North Carolina. To help plan a visit to Jackson County, request your free visitor’s guide today.